Benfica stormed to an impressive 6-2 victory over high-flying Braga as they turned on the style to up to 2nd in the league, while city rivals Sporting suffered a surprise defeat at the hands of an impressive Guimaraes outfit. Going into the game at the Estadio da Luz, Braga had lost just once this season, a narrow defeat to reigning champions Porto, and sat one point above their Lisbon opponents, in the driving seat to mount a serious title challenge. But there was only one victor on the night, with Pizzi opening the scoring with a delightful placed effort down to goalkeeper Tiago Sá's left, before centreback Jardel beat Sá to the ball to header home for the second just before half time. Left back Grimaldo found the back of the net once again this season as he capitalised on some questionable defending to give Benfica a 3-0 lead just after the break, while Braga then closed the gap after the free-scoring Dyego Sousa yet again headed home, past the impressive Vlachodimos. But Benfica continued their newfound goalscoring ability, with Jonas and Cervi extending the lead, before right back Andre Almeida fired in a truly sensational volley from outside the area into the top corner to make it 6-1. There was time for a Braga consolation though, with João Novais making it 6-2 with an impressive strike. 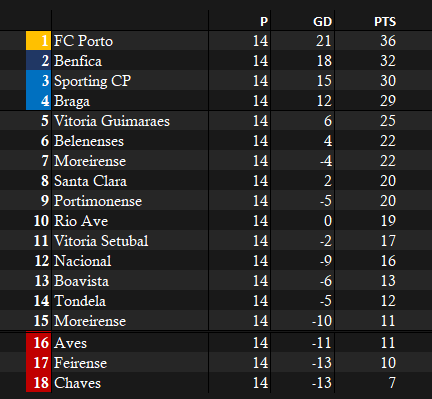 The result sees Benfica move up to 2nd, ahead of both Braga and rivals Sporting, who have a game in hand. They are, however, still 5 points behind Porto. That is because the reigning champions came from behind to topple managerless Rio Ave to win a record 15th match in a row; only once before have they managed to win 15 fixtures on the bounce. Napoli loanee Carlos Vinicius, who has been one of the top performing players on the league this season, put Rio Ave ahead early on, but a Brahimi goal from a Tiquinho Soares knockdown followed up with a Moussa Marega strike meant Porto secured a comeback and yet another win. Elsewhere, Sporting suffered defeat to end what had been a superb run of fixtures for Sporting under new manager Marcel Keizer, who were previously unbeaten under the Dutch coach having won 9 of their 10 fixtures, scoring 34 in the process. It was Toze that got the goal that condemned Sporting defeat and a disappointing end to the first part of the season, ensuring that Sporting went into the Christmas break with defeat under their belts.